Adjust the triangle to verify your conjectures. 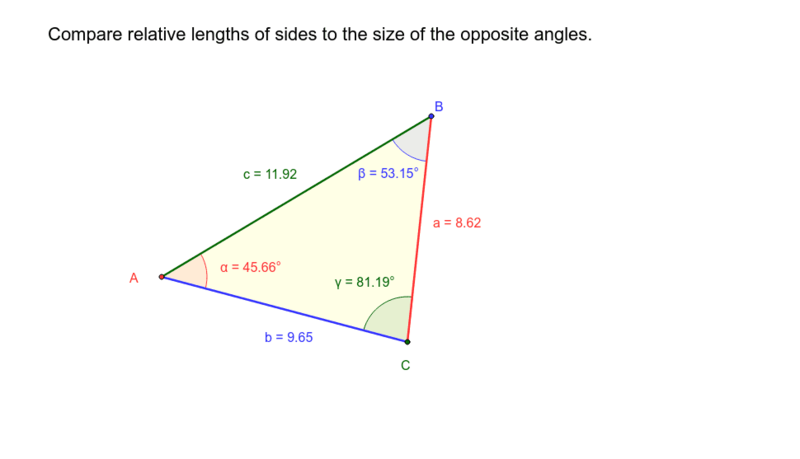 INVESTIGATE IT: What is the relationship between the sides and angles of any triangle? Resize the triangle above as you answer the questions to be sure that your answers are true. 1. What is the name of the side that is opposite <A? 2. What is the name of the side opposite <B? ﻿3. What is the name of the side opposite <C? ﻿4. Locate the largest angle in your triangle above. Is the largest side of your triangle across from it? Yes, the largest angle is across from the largest side. No, the largest angle is not across from the largest side. ﻿5. Locate the smallest angle in your triangle above. Is the smallest side across from it? Yes, the smallest angle is across from the smallest side. No, the smallest angle is not opposite the smallest side. 6. What can you say about the relationship between the sides and angles of a triangle?